The Topaz range of signature pads come with MS Word and Abobe Acrobat plug-ins. An extensive SDK is also available on request, just contact our technical support team by using the enquiry form. 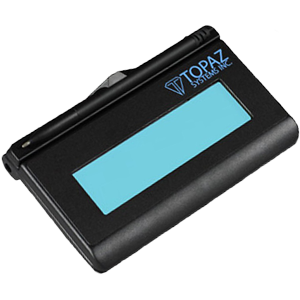 SigLite® is Topaz's low-cost, pressure-sensitive electronic signature pad. SigLite features all the high quality biometric and forensic capture techniques of a SignatureGem tablet but with a low-cost touchpad and stylus in place of the active electromagnetic pen and sensor. Featuring a touchpad (protected by an optional replaceable overlay for longer life) and stylus. SignatureGem LCD 4x3 includes all the high-quality capture features of a Topaz electronic signature pad with the added feature of an LCD interactive display, allowing users to see "electronic ink" under the pen tip as they sign as well as navigate and display text and graphics. The wide signing area and rugged tempered glass signing surface make this a versatile pad for the most demanding applications. USB Topaz SigLite LCD 1x5"
Serial Topaz SigLite LCD 1x5"
Backlit USB Topaz SigLite LCD 1x5"
Backlit Serial Topaz SigLite LCD 1x5"
Backlit USB and Serial Topaz SigLite 4x3"
USB Topaz SignatureGem LCD 1x5"
Serial Topaz SignatureGem LCD 1x5"
Backlit USB Topaz SignatureGem LCD 1x5"
Backlit Serial Topaz SignatureGem LCD 1x5"
USB and Serial Topaz SignatureGem LCD 4x3"
USB and Serial Topaz SignatureGem LCD 4x5"